Eco-Friendly Honey Candles. Unlike soy and paraffin waxes, beeswax is used essentially in its native state. There is no bleaching or hydrogenating and does not require large amounts of agricultural land. 100% pure beeswax is the purest and most natural of all waxes (including vegetable waxes such as soy) with the least processing and no additives. 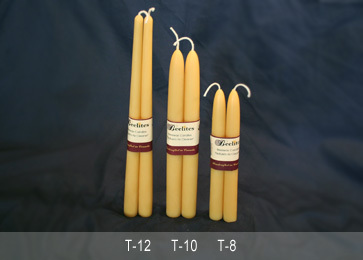 Clean air: unlike other candles that produce toxic fumes when burned, Beelites beeswax candles produce no toxic by-products and are non-allergenic. This is why the American Lung Association recommends beeswax candles. Draw in contaminants: As the candle burns, it produces negative ions that circulate in the room and attract pollutants. Neutralize pollutants: such as dust, odours, mould, bacteria, viruses and other toxins. Produce calming and balancing vibrations: When beeswax candles burn, they also produce a multi level vibration that calms the inner senses. This vibration can be observed within the glowing halo surrounding the flame. It is said that burning a beeswax candle in the bedroom for 30 minutes before going to sleep will result in a more restful sleep. 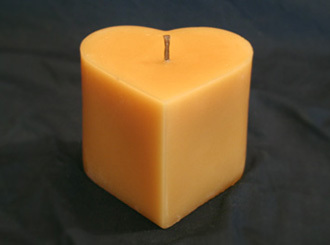 Honey scent: Beeswax candles will sweeten the room with the pure scent of honey. Burn longer than paraffin wax. Virtually drip less in a draft-free environment. Frosted Appearance will develop over time. 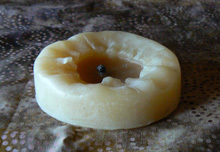 This natural Process is called 'bloom' and shows that the candle is pure beeswax. The candle can be buffed to appear shiny if you prefer. To prolong the life of your beeswax candle keep the wick at 1/4 inch in height, trimming with scissors if necessary. As the candle melts push the soft walls of the candle inwards, keeping the melted wax from dripping over. The end results will look something like the picture below. Burn times of each candle are approximates. Candles burned intermittently will last longer than one burned continuously. 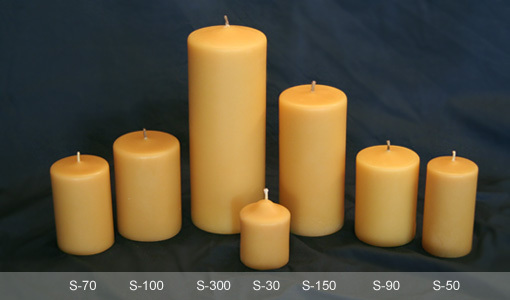 Temperatures of the environment will also affect the burn time of each candle. To extend burn times, chill candle before lighting.